Or an eagle sable, armed, beaked and langued gules. 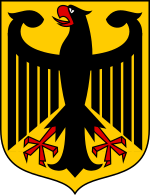 Ami opa ase ile Germany je ami orile-ede Jẹ́mánì. Àtunṣe ojúewé yi gbẹ̀yìn wáyé ni ọjọ́ 9 Oṣù Kẹta 2013, ni ago 05:55.